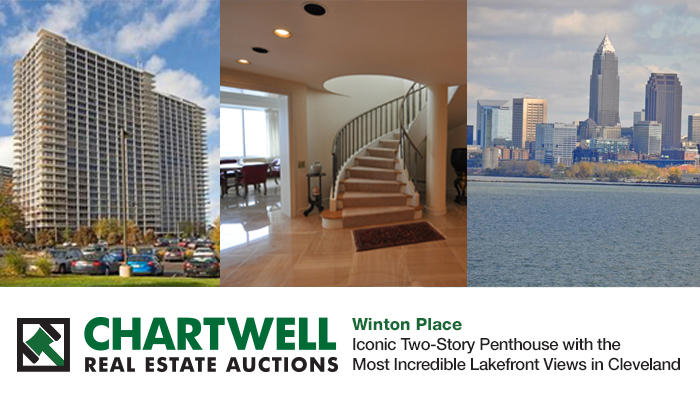 Cleveland, OH (September 11, 2017) – The gold standard in Cleveland living, Winton Place is the area’s most desirable residential condominium community, with unobstructed views of the lake and the city skyline. Chartwell Real Estate Auctions is proud to present its two-story penthouse as a premium real estate auction, with bidding to commence at only $225,000. The beneficiary of a trust has ordered the immediate sale of the unit, Suite 3005 at 12700 Lake Avenue in Lakewood, OH. It consists of approximately 5,404 square feet of luxurious living space, including two separate master suites. Walls of floor-to-ceiling windows border its open floor plan, framing spectacular sunrises and sunsets. The kitchen employs solid granite countertops, light hardwood cabinetry, and modern appliances, while the master bathrooms display marble and granite finishes and a shower/spa area with skylights. A wraparound concrete patio overlooks stunning panoramic vistas. This penthouse unit is the only one to include four permanent indoor parking licenses. Winton Place also offers concierge service, a secure gated entry and a lobby with a 24-hour attendant, a full-service hair and nail salon, a huge indoor pool and sauna, a fitness center, tennis and basketball courts, laundry facilities, a party room, a conference center, a recreation area, and underground access to the award-winning Pier W Restaurant. The auction of this one-of-a-kind residence will be conducted by Michael Berland on October 7 at 11:00 a.m. Interested parties can preview the property at one of several Sunday open houses, which will take place between 12 noon and 1:30 p.m. on September 17, September 24, and October 1. For more information on the unit and the auction, contact Mark S. Abood or Cameron Price at 216-861-7200. Hanna Commercial Real Estate is a full-service real estate company with offices in Ohio, Pennsylvania and Michigan. For over 75 years, they have been a leader in the commercial property marketplace, successfully providing clients with creative and comprehensive real estate solutions. Hanna CRE specializes in real estate consulting; industrial; office; retail sales & leasing; corporate services; property & asset management; investment sales; land brokerage; tenant representation; build-to-suit representation; accelerated marketing (auctions); project management; and property valuation. For more information, please visit: www.hannacre.com.